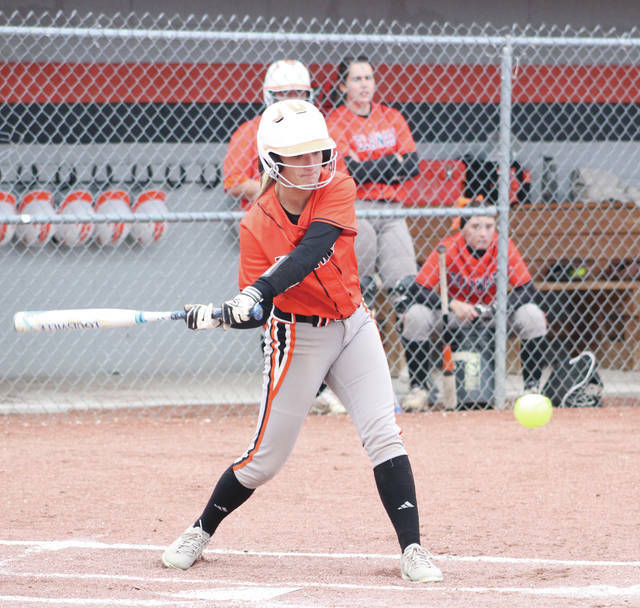 Hayes’ Chloe Barton takes a cut during the first inning of Tuesday’s OCC showdown against visiting Hilliard Bradley in Delaware. The Delaware Hayes softball team seemed to have everything going its way after a Mallory Stonebraker solo home run in the fifth inning. Hilliard Bradley’s Amanda Nashalsky homered twice, including a go-ahead three-run shot as a part of an eight-run sixth and the Pacers couldn’t recover in a 10-5 loss to open OCC-Cardinal play Tuesday night in Delaware. Pitcher Haley Osborne set down the first seven batters she faced as the Pacers built a 4-0 lead. She seemed to have things well in hand even after giving up her first baserunner, Lauren Cerda, on a hit-by-pitch. Cerda was thrown out by catcher Bobbi Adams on the next pitch on a stolen base attempt. But, the next hitter, Annika Murray, got Bradley into the hit column and Jaiden Bryant tripled her home to cut the deficit to 4-1. Even that seemed like a blip on the radar, though. Amaia Daniel and Stonebraker each had RBI singles and an error scored a third run in the first, and Chloe Barton added a sacrifice fly in the second inning to give the Pacers a 4-0 lead. Stonebraker, Lexi Mattix and Alex Armstrong had two hits apiece and Stonebraker drove in a pair of runs to lead the Pacers (6-1, 0-1). All nine batters in the Hayes lineup had a hit by the end of the third. Liaiha Slayton led off the fourth with a hit, but was erased on a double play. It turned out to be a missed opportunity after Adams, Osborne and Armstrong each singled to load the bases. Bradley pitcher Lexie Hilling got a strikeout to end the threat. Bradley hitters found their stroke in the sixth. Lauren Renner led off with a home run, Lexie Hilling followed with a double and McKenzie Hilling singled before Heather Holly’s hit cut the deficit to two all before an out was recorded. Then, with one swing of the bat, Nashalsky gave the Jaguars the lead with a one-out, three-run homer over the wall in right-center. Osborne came back with a strikeout and a would-be inning-ending groundout. But, an error extended the frame. And Bradley made Hayes pay. Bryant singled and Renner doubled her home off the wall in center. Lexie Hilling singled off the wall in center to score Renner and McKenzie Hilling found the wall in center to push the Jaguar lead to 9-5 before the Pacers could get out of the inning. Nashalsky added her second home run of the game with one out in the seventh to cap the scoring. Lexie Hilling got the win in the circle for the Jaguars (3-1, 1-1) and finished with a team-high three hits. Hayes continues league play today at Worthington Kilbourne. First pitch is scheduled for 5:15 p.m.